Cause A fungus, Claviceps purpurea, that affects about 400 species of grass as hosts, including all species grown for seed. The disease is most common in bluegrass, bentgrass, and Chewings fescue but may occur in perennial ryegrass or tall fescue. Sclerotia of the fungus overwinter on or near the soil surface and germinate in spring, giving rise to stalked, spherical structures that eject ascospores. The flower is the only part susceptible to infection. The degree of infection depends on the amount of inoculum present and on the susceptibility of the crop species. Temperature, light, and other environmental conditions that affect the duration and uniformity of flower opening also determine the severity of infection. Infected florets exude a sticky, viscous combination of plant sap and conidia, commonly referred to as honeydew. Its high sugar content attracts insects, especially flies, which efficiently spread the disease (secondary spread). The disease cycle begins again when mature ergot fall to the ground. Flower structure is important in the host's susceptibility to ergot. Species in which glumes tend to remain closed during flowering generally escape infection. Grasses such as annual bluegrass are highly susceptible, and their presence as wild grasses in field borders and headlands are an important source of inoculum. Symptoms Hard, gray to purple-black, elongated bodies (sclerotia) replace seed. Sclerotia range from similar in size to a normal seed to two to three times longer than normal seeds. The sclerotial stage is preceded by a "honeydew" stage in which a sticky mass of conidia oozes from infected florets. Rotate field out of susceptible grasses. Remove as much ergot as possible from the field during harvest. 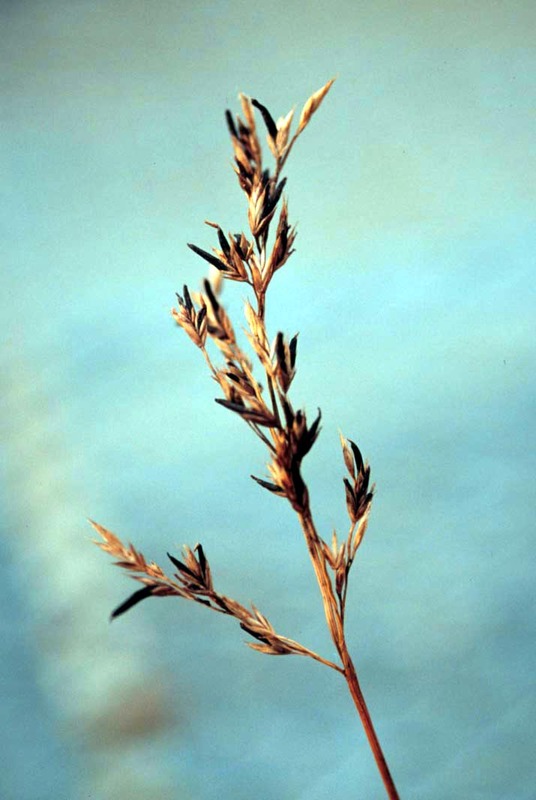 Ergot can be removed later during seed cleaning. Destroy screenings containing ergot. If buried, they must be more than 3 inches deep. Use resistant cultivars or ones that flower only a short time. Prevent heading in pastures or in field margins. Open field burning will reduce but not eliminate ergot. Propane burning has not proven effective. Strobilurin fungicides (Group 11) are labeled for use. Do not make more than two (2) applications of a Group 11 fungicide before alternating to a labeled fungicide with a different mode of action. Abound at 6 to 15.5 fl oz/A on 10- to 14-day intervals. May be applied up to 8 days before swathing. 4-hr reentry. Tilt (Group 3) at 4 to 8 oz/A just before anthesis. Do not cut hay within 20 days of the last application or graze treated areas within 140 days of the last application. For use in Oregon, Washington, Idaho, Minnesota, and Nebraska only. 12-hr reentry. Premixes of fungicides are available for use. Quilt (Group 3 + 11) at 14 to 27.5 fl oz/A (except bluegrass apply at 14 fl oz/A) or Quilt Xcel (Group 3 + 11) at 14 to 26 fl oz/A (except bluegrass apply 14 fl oz/A) on 14-day intervals. Make the last application at least 20 days before seed matures. Do not feed hay cut within 20 days of the last application. Do not graze treated areas within 140 days of the last application. For use in Oregon, Washington, Idaho, Minnesota, and Nebraska only. 12-hr reentry. Trivapro (Group 3 + 7 + 11) at 16 to 27.4 fl oz/A on 14- to 28-day intervals. Do not make more than two (2) sequential applications of Trivapro or other Group 7 or Group 11 fungicides. Preharvest interval is 20 days. 12-hr reentry.